Last weekend was our anniversary, and we spent it in Chattanooga (#noogastrong!) because it’s close enough to home, yet still feels like a destination trip. We’ve stayed in Chattanooga a lot, and never at the same hotel or B & B, and always enjoyed the lodging. Same goes for restaurants – even though we have our favorites, it seems like there is always a cool new restaurant to visit, and enough of them that you can never visit them all. 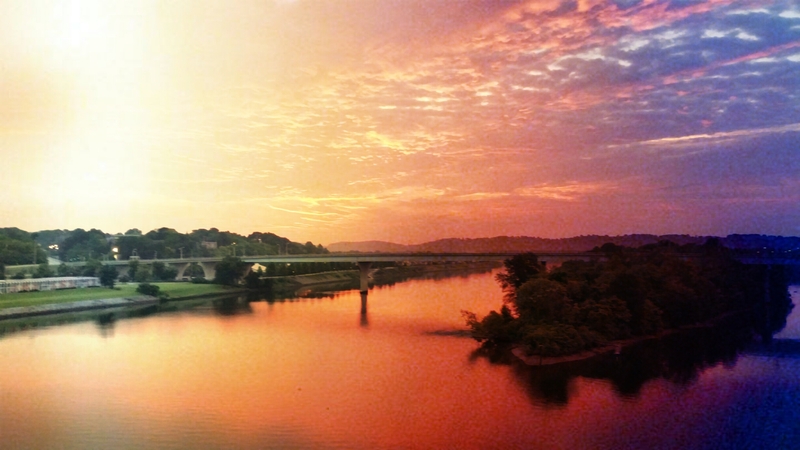 Chattanooga is a very friendly family town, yet still has a fresh vibe to it. It seems like a big city in some ways, while still retaining a hometown feel. And, like I always do when we’re traveling, I run around the city. Chattanooga has a lot of bridges and I always try to run over a few of them on my run. Because it’s still summer, I have to run early (ok, I would anyway…) so I usually am able to see the sun rise, and this is what I saw last weekend. Soooo pretty! I had the time to stop and take a picture because our Air Force son, who is on a deployment, Skype-messaged me early (it’s a 7 hour time difference) to run some ideas for his sister’s birthday gift by me. I kept having to stop running, so I was able to get this picture, but when your child is on the other side of the globe and they get in touch, you stop whatever you’re doing! I hope you have a great week; enjoy your Monday links! Hate it when people step into your personal bubble? Really, it’s just an illusion. A deceptive but effective booty workout. I tried it & it KILLS! Diagrams about chocolate and desserts, because…. chocolate! 6 words that can change a home. Short read. Important. I love these ideas for making pretty packages! Perfect homemade pita bread – I’ve made them and they’re delicious!